Murphy flew 53.748 in Qualifying so has a real opportunity here. Hall is currently Fastest Loser so may have a free pass if Murphy beats him. That's great news for Hall but Murphy seems to have just lost his nerve out there and made some monumental mistakes that have cost him dearly. Bitter disappointment for Murphy and a missed opportunity. Brageot, Sonka, Velarde, Goulian and Hall all through to the Round of 8. Chambliss says his strategy is to put the pressure on McLeod... and he's off to a great start with 199kts into the track. He's into the first VTM and it's looking as though he may have stalled and it's affected his exit, the tail wind is playing havoc as Chambliss readjusts into Gate 7. Another VTM and it's much more on form. Chambliss waits for the review but it's all good.. he pushes fast, flies on the edge and puts the pressure on McLeod in this heat. McLeod flew faster in Qualifying, retaining his 2nd place finish despite an issue with his magneto. McLeod knows the podium well here in Abu Dhabi and will be flying for another... he's just got to get past Chambliss first. McLeod cleared into the track and is in at 200kts, through the first chicane and against the ghost plane of Chambliss it looks like McLeod has a slight disadvantage. Tidy flying but Gate 7 is causing problems AGAIN as McLeod picks up +2s... he could be on pace for a Fastest Loser spot so it's all about getting the fastest time as possible. McLeod can't match Chambliss but he takes the Fastest Loser spot from Kopfstein. Show the photos for Kirby. Just three pilots have flown error-free today: Sonka, Goulian and Chambliss. 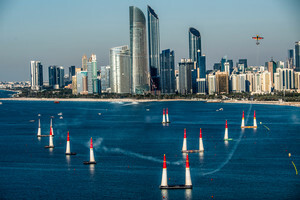 Ivanoff has enjoyed a race win in Abu Dhabi before... but he's got a really difficult journey to the top step as he comes up against Muroya in this Round 14 heat. Ivanoff looking clean and in control but the pace has got to be there... and it is. VTMs are solid and whilst not textbook flying, he's thrown down the gauntlet and Muroya has got to be precise and totally in control. Go YOSHI !! Smoke on !! Go!! Yoshi! ! 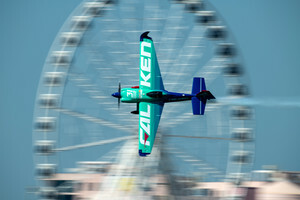 Go Team Falken! Muroya is last up in the Round of 14. The fastest pilot yesterday in Qualifying, he's had a confident start but needs to watch Gate 7. Ivanoff's time means Muroya has a lot of work to do, and with 198kts into the track the splits are looking off pace through the chicane, and too much height possibly in the VTM but the descent is quick and Ivanoff has the advantage. Muroya needs to work REALLY hard in this second Lap and he pulls off a super-quick VTM... splits are green and Muroya turns it around to take the heat win and a place in the Round of 8. We're satisfied but the job is not done yet... I think it'll be a nice fight and I think Matt will push, so looking forward to the duel.